Pall Mall. The first street in London to be lit by gas, in 1807. 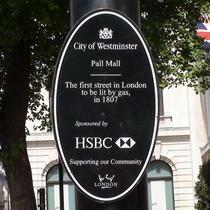 Sponsored by HSBC, Supporting our Community. We were surprised to see a memorial plaque attached to this piece of street furniture, a way-finding finger-post. Is this the only one? Or are there lots and we've just failed to spot them? Given the subject commemorated perhaps this is a well-placed rarity. Plaque unveiled by Orwell's son Richard.